The Carden-Loyd Mark VI tankette was probably one of the most influential designs of the interwar. It was largely copied abroad, built under licence and adopted by 16 armies throughout the world. Its direct legacy included the French UE, Polish TK, Japanese Te-Ke, Italian CV, Russian T-27, Czech Tançik vz.33, and even the Panzer I. The main reason of its success was a mixture of affordable cost, easy production, maintenance, transport, speed and versatility. It was overall clearly reaffirming the concept of quantity over quality. 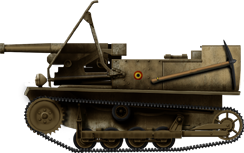 The tankette concept was a typical interwar product, born in the fertile mind of Royal Engineer Major Giffard LeQuesne Martel (born 1889), who had already worked on the tactical development of tanks during WW1. He never stopped theorizing about future tank warfare and, eventually, built in his own garage a very small tank with various commercially available parts. This tankette was seen mostly as a self-propelled skirmisher, an auxiliary transport and scout. It was first shown to the War Office. The War Office, in turn, contracted Morris to built 4 models in record time in 1925, for a new live demonstration and more tests, followed by eight improved “Morris-Martels” to form an active evaluation unit. In 1927, Crossley also took the idea seriously, releasing a one-man tankette rolling on Kégresse tracks in 1926. Several other companies also saw industrial perspectives in Martel’s concept. One of these was the Carden-Loyd Tractors Ltd, founded by John Valentine Carden and Vivian Loyd. 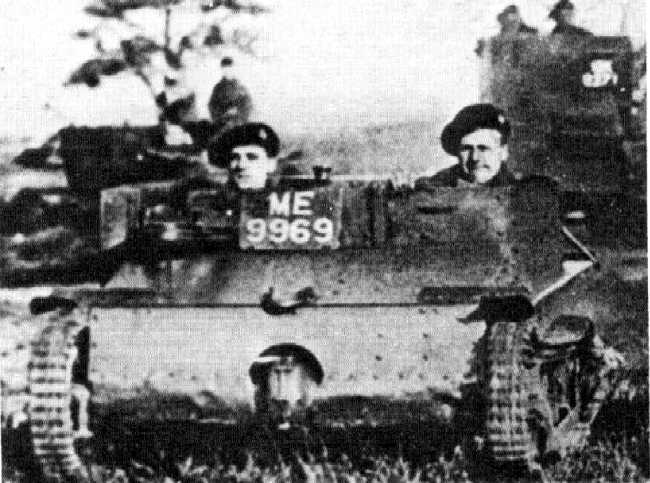 Either by being well informed or by making correct guesses of British army potential specifications, the Carden Loyd company was the first to design a one-man tankette. It was thoroughly demonstrated at Kensington before the War Office, which ordered a second test vehicle. Following this, they developed the Mark I and Mark I*. The main differences between the two were the durability of the suspension system and increased speed. The next Mark II, although overall similar, replaced the original 14 steel road wheels by four rubber bogies. The Mark III was nearly identical except some improvements to the new suspension. Later on, they did a complete redesign of this concept. The original tank could be propelled by a light engine and was light enough to be transported easily. But it definitely lacked protection and effective firepower on the move. To cope with these issues, the only solution was to design a two-man tank. A single prototype was built, followed by the Mark IV. Bigger, lower, more stable, with a more powerful engine but sharing a rather similar, although reinforced suspension. Some changes included the replacement of the upper track guidance bar by four small return rollers. The new two-man tankette conceived in 1926 had all the characteristics of a winner. The crew comprised a driver and a machine-gunner, which allowed each to be fully concentrated on his own task. 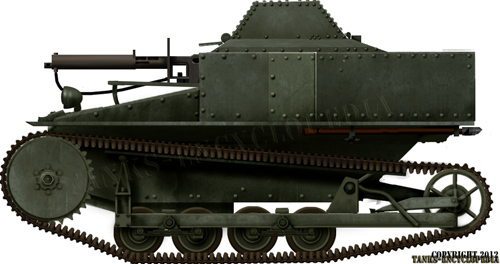 The tankette could be used as a mobile machine-gun nest, where it was needed most, equipped with the standard-issue water-cooled Vickers cal.303 (7.62 mm) machine-gun. Later on, a special mount, which allowed some traverse and high angle fire, was tried. The famous brand took interest in Carden Loyd’s prototypes by 1927. By 1928, an agreement was reached, and Carden-Loyd was bought in March for a comfortable sum. John Carden was named technical director. The ingenious pair designed their next, and most successful model so far, the Mark VI. It started with a new model, powerful enough to be used as a light gun tractor as well, revealing all its potential. A smaller tracked trailer was designed for this task, capable of carrying a 2 (40 mm/1.57 in) ordinance field gun, 37 mm (1.46 in) howitzer, a 20 mm (0.79 in) Oerlikon antitank gun, or ammunition (with the GS trailer). The hull was slightly larger and longer and the suspension had to be reworked. This was the Mark V.
It was the blueprint for the Mark VI, simplified for mass-production and export. The Mark VI was a small, square-shaped 1.6 tons steel bucket, with an open-top superstructure. The driver sat on the front left and the .303 machine-gun (7.62 mm), which could be replaced by a heavier 0.50 cal. (12.7 mm), on the front right. A small compartment at the rear contained ammunition and spares. The Ford engine gave 40 bhp @ 2500 rpm, and the petrol tanks were on the front. Top speed (on road or flat grass terrain) was an average 25 mph (40 km/h) and the range 90 miles (144 km), largely sufficient for a breakthrough in a WW1-style static front. The Mark VI’s design was not static either. The model would evolve into three distinct types until the end of the production in 1935. 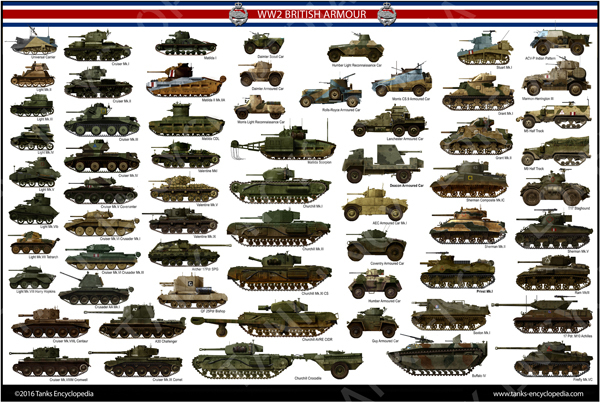 The British army took over the bulk of it, respectively 325 (other sources talks about 348) of all models, in versatile small tanks companies. If the early production machine was open-topped, the next evolution, meant for export, was entirely protected. Its most distinctive feature were the two small “domes” protecting the crew’s heads. This was also the most widely exported. The last production model (in 1930), was completely reshaped. The suspension and tracks were cut short, as was the hull, now built of simple steel panels in a trapezoidal shape. Simpler to build, lighter, this version was by far the cheapest of all and was the most produced by the Royal Ordnance Factory. Apart from scouts, machine-gun carriers, and light gun tractors, these tankettes were also used as mortar carriers and smoke projector vehicles. Being the cheapest tank in the world, at about one-third to one-fourth of the price of the French Renault FT and derivatives, and thanks to Vickers’ worldwide commercial antennas, the Mark VI was demonstrated to foreign commissions in 1928-29, and many were bought for evaluation. Major industrial countries would build their own variants en masse, like France – 5168 Renault UE, USSR – 3228 T-27, Italy – 2700 CV-33, Poland – 690 TK3-TKS, Japan – 823 Te-Ke, and Czechoslovakia – 74 vz.33. Other countries would buy almost unchanged models (Thailand, Netherlands, Belgium, Finland, Greece, Siam, Bolivia, Chile) or build them under license, like Canada, India, Portugal. The Chinese Nationalists obtained 24 Mk.VI tankettes in 1929, which are known to have fought on the Lunghai front. By 1939, this was the most widely used tank in the world, especially fielded by small armies. Their earliest combat trial consisted of a few engagements during the Chaco war between Bolivia and Paraguay (1932-35). Most tankettes, alongside a few Vickers Mark Es, were sent to overwhelm the defenses of Fortin Nanawa, duly reinforced by the Paraguayans, an episode called the “Verdun of South America” (July 1933). This ended as a defeat for the Bolivian army and its commander, former WW1 veteran officer Hans Kundt. The second engagement came with British forces in May-June 1940, opposing the German forces. Alongside the more famous “Bren-carrier“, around 200 tankettes took part in the defense of the Dyle-Namur line (in Belgium). Some Mark VIs fielded by Dutch units also saw action. Nearly all were left behind at Dunkirk. The remainder, former training vehicles and auxiliaries were mobilized to face the awaited German invasion of the British mainland in July-August. 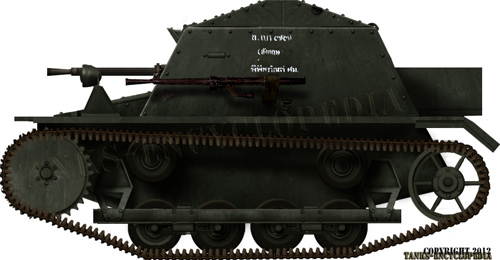 Later on, at the end of 1940 and in January 1941, the Franco-Thai war saw most of the available Thai Mark VI tankettes engaged against the French Forces. Many were destroyed by artillery or gun-armed FT tanks. Later, during the Balkan campaign (March-April 1941), Yugoslav and Greek Mark VIs were also committed in action, hopelessly. Many foreign-built tankettes saw action during the war: The Soviet-built T-27, the Italian CV 33, 35 and 38, the Japanese Te-Ke, Renault UEs (under German colors) and most famously 100,000+ Universal Carriers throughout the British Empire. The main production model, also the most exported and built under license. It was, this time, completely protected from above, with two hexagonal domes for the crew members. The late production model, only retained by the British army, and built by the Royal Ordnance Factory. A Carden-Loyd Mk.VI of the Royal Thai army, January 16, 1941, Burapha Siamese army, battle of Phum Preav. 30 tankettes of the 1930 type and perhaps 30 others were purchased in 1935. Belgian SA FRC 47mm, tank hunter, self-propelled gun. 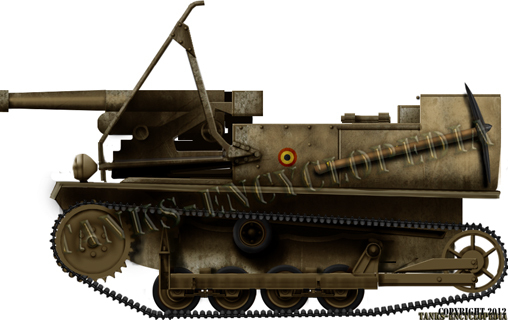 The Belgian Commission permanente de Motorisation purchased six tankettes of the Mark VI type in 1929, but they converted them into SPGs, equipped with the standard-issue S.A. 47 mm (1.85 in) built at Fonderie Royale des Canons (FRC), Liege. It was found more practical and effective to carry than to tow these guns. They were part of the Chasseurs Ardennais until 1938, then spread into two Régiments Cyclistes-Frontière, which ambushed a German column on May 10, 1940, alongside the Meuse river. was the universal carrier based off of this design? There’s a photo of a Carden-Loyd Searchlight Tank, is there any information about this?